Our latest long-distance cycling visitors in the Peninsula store on Wednesday of last week were Jay Knight and Denny Salisbury. They are veterans of the US Marine Corps, and are riding from Boston to Seattle to raise funds for Child's Play, a non-profit that provides toys and games to children's hospitals across the country. 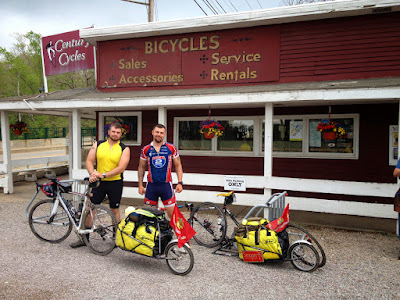 To see more photos of touring cyclists that have visited all three of our stores, check out our Bicycle Touring Photo Gallery. Poll: What's your favorite bike brand? Thanks for Biking to the Ballpark! More bike tourists in Peninsula! Chris Lenaghan - Wheelie Master! Bike To School action all over Northeast Ohio! 2014 Bicycle Touring Season unofficially begins!